I’m so excited to share this amazing Friend Friday post by Chelsea! She is an amazing wife, mother of 4, yoga instructor, runner and just a sweet friend. I first met Chelsea when she was here for the summer many, many years ago when she was staying with her Aunt Bev, who is another amazing friend. She was helping Aunt Bev with her four kids at the time and getting her house in ship shape. I remember thinking, “I really need a Chelsea in my life.” Haha. 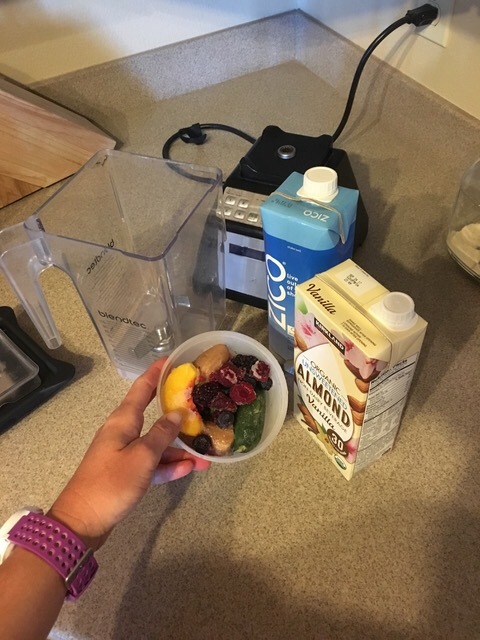 Chelsea has an amazing smoothie recipe to share with us today! Thanks so much Chelsea!! John and I met at Dixie College. After moving around a bit for school and work, we came back to St. George and have been here for 10 years. Our oldest is 11 and our youngest is 2. I enjoy baking, running, yoga, taking pictures of lightning, and getting out on my paddle board. 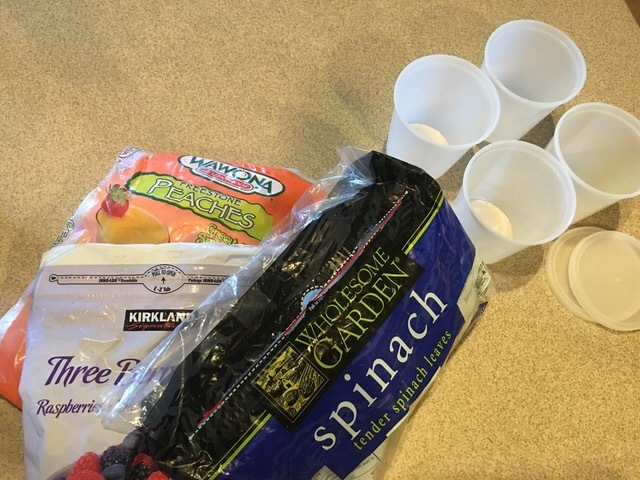 Here is the smoothie stuff. So here’s the deal, I don’t really have a specific smoothie recipe. Yes, I’ve looked up recipes on Pinterest and googled recipes from different smoothie joints, but really I use whatever ingredients I happen to have that sounds good to me at the time. The whole reason I want to drink a smoothie is because it’s a simple and great way to get fruits and veggies into my diet as a busy mom. 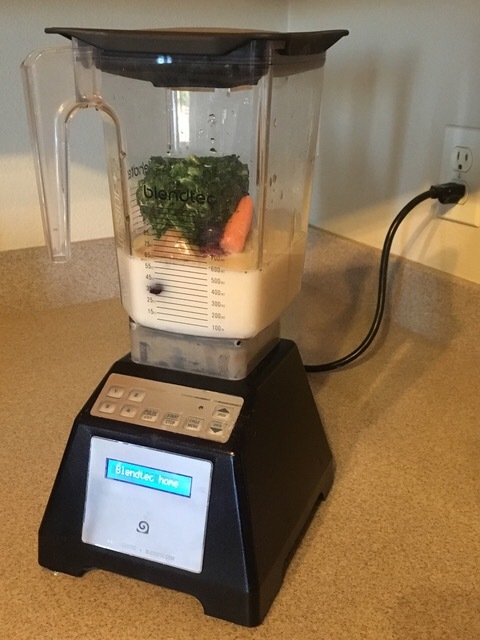 A few years ago I realized that the whole smoothie trend is great and all, but we are only going to be successful at consuming healthy smoothies if making one is easy. And that’s why I smoothie prep. 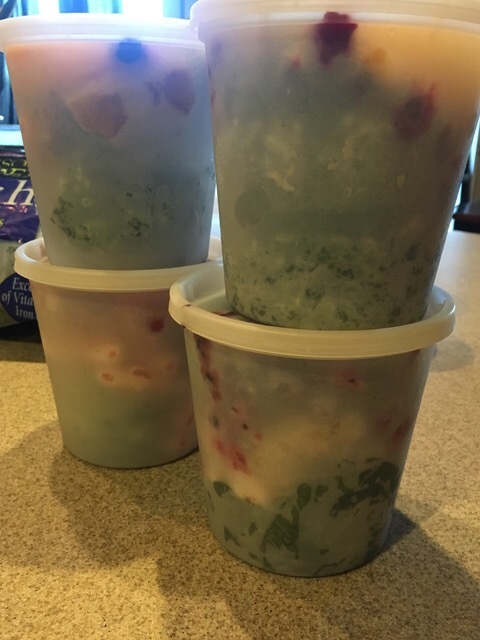 put the lids on, and then store the containers in the freezer. I always use spinach and/or kale. That goes in first because it’s easy to smash down. 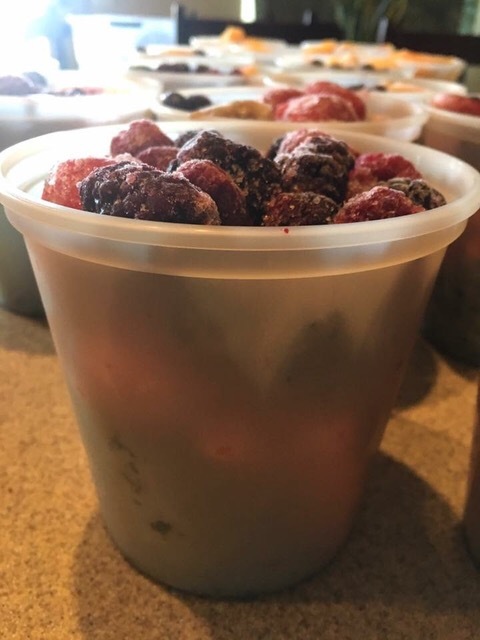 Then I add strawberries, bananas, berries, carrots, those cute little baby cucumbers Costco sells, kiwis, pineapple, tomatoes….truly whatever you want. Not every smoothie is the same. Sometimes I even add parsley, or various seasonings like cinnamon or nutmeg. 1. I only buy the banana in the bag, or with the red tape on them because they are cheaper, and they make a smoothie a bit sweater. 2. I buy the big bag of spinach from Costco, you know the one that we all have good intentions of using? I will use it for meals for a few days, and then before it starts to go bad, I throw the entire bag of spinach in the freezer. On smoothie prep day, I pull out the bag and use it for my smoothies. 3. Repeat the same idea for kiwis, pears, grapes, or whatever produce you buy but then doesn’t get used before it goes bad. When I want a smoothie, I take a container out, add my liquid of choice, and blend it up. I love to use coconut water or almond milk. Sometimes even pomegranate juice. 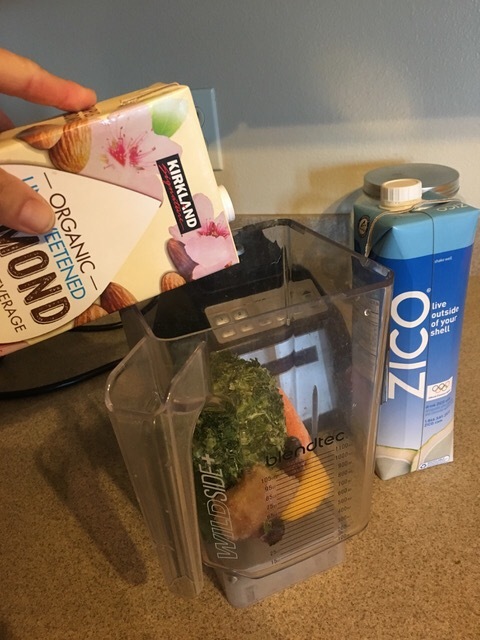 I will also add protein powder, sometimes almonds, chia seeds, or whatever else I want to spice up the smoothies. And if I know the smoothie really isn’t going to taste great, I’ll add some honey or agave, but just a little bit! And then I drink it! I usually end up with one giant cup of smoothie, or two glasses of what’s pictured here. Sometimes my kids drink the extras, or sometimes I save the rest for later in the day. You can actually buy thick smoothies straws from Amazon, too. Hey Y’all! I’m still here. 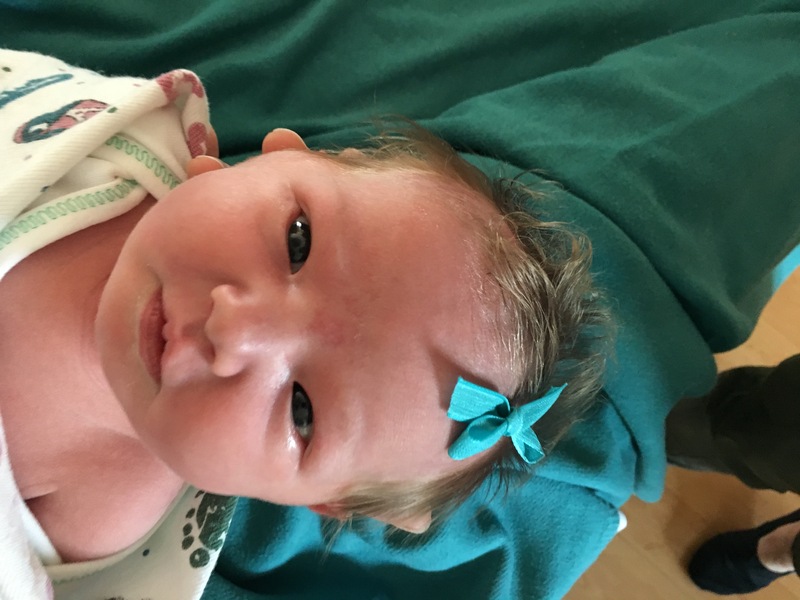 I’ve just been busy with welcoming this new little grand daughter into the world and helping with her adorable big brother. Seriously, grand children are the spice of life (no pun intended ha :). Isn’t she ADORABLE!!! We all have so much love for her all ready and are so happy she’s finally here!! She’s perfect and her big brother is just as adorable. Now that we have the fun stuff out of the way, let’s move on to my next recipe to share. Lately, I’ve had limited time so I’ve opted for some of the quickest recipes that I can come up with. This idea came from a good friend’s daughter and I thought I would use it for a salmon marinade. It’s super simple–2 ingredient simple! Ready??? I like the salmon from Costco but if you live someplace where you can get fresh salmon, that’s best :)! Harmons has great salmon too. 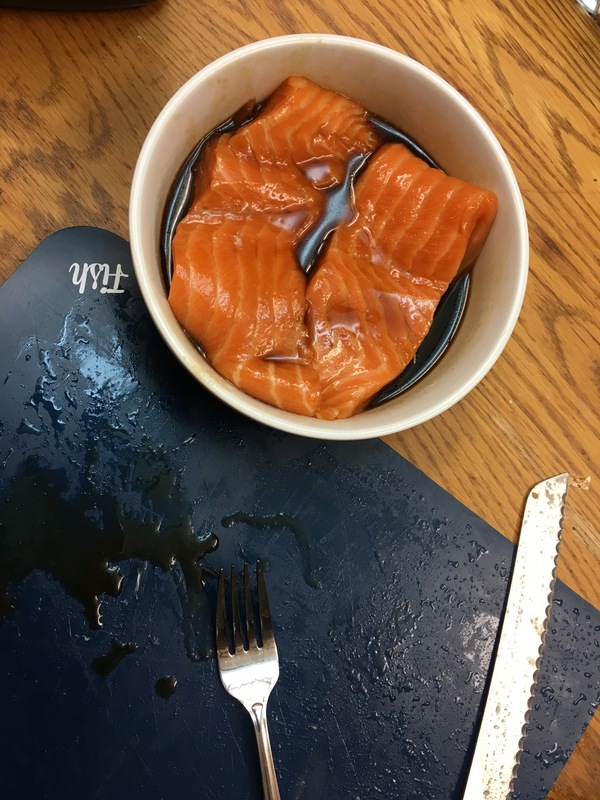 Mix together and place salmon portions in marinade. I let that sit for a 5-10 min and then I started some quinoa. I like cooking my quinoa in chicken broth. It’s so much more tasty! 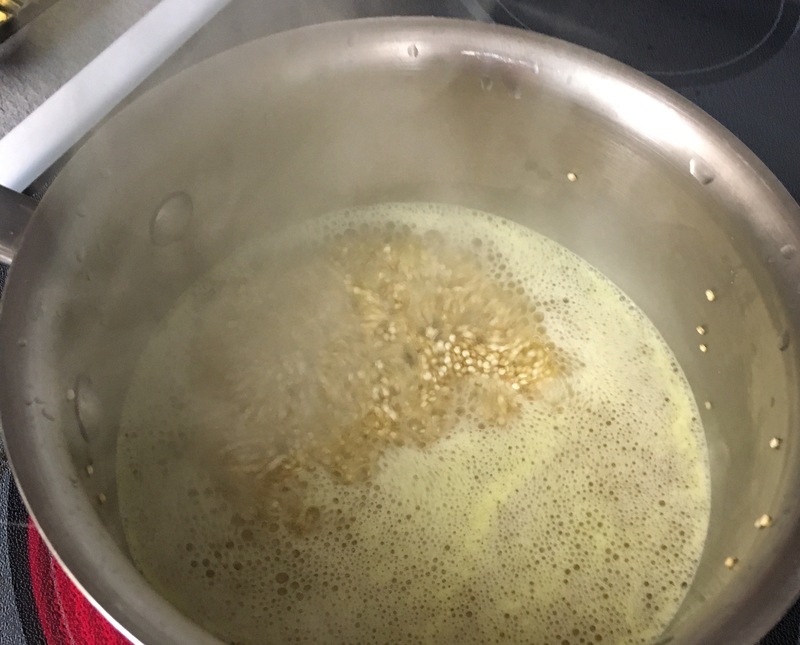 Make sure you rinse the quinoa before cooking it. If you don’t, you will get a bitter flavor and it’s nasty. Want to ask me how I know that? LOL. I just subbed out the chicken broth for the water on the cooking instructions on the package. 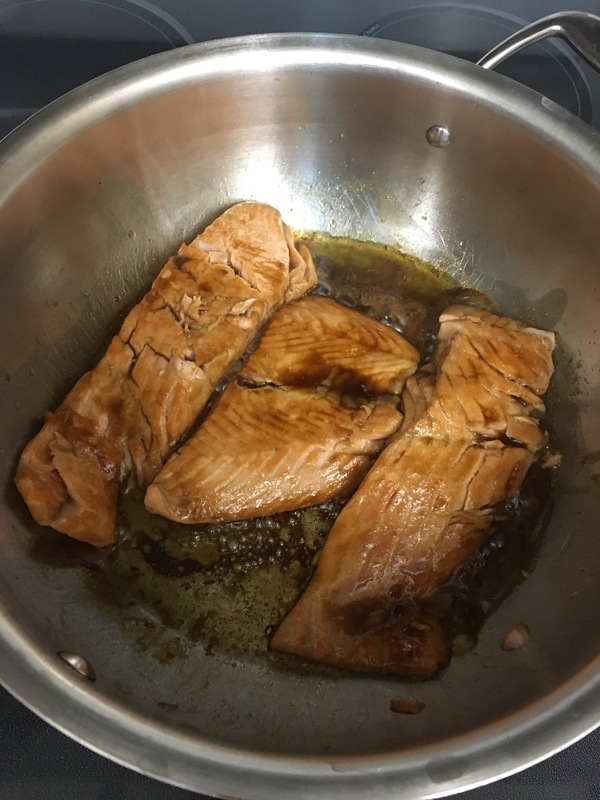 Once the salmon is done marinating for a bit, I put a little olive oil in a pan and cook the salmon. 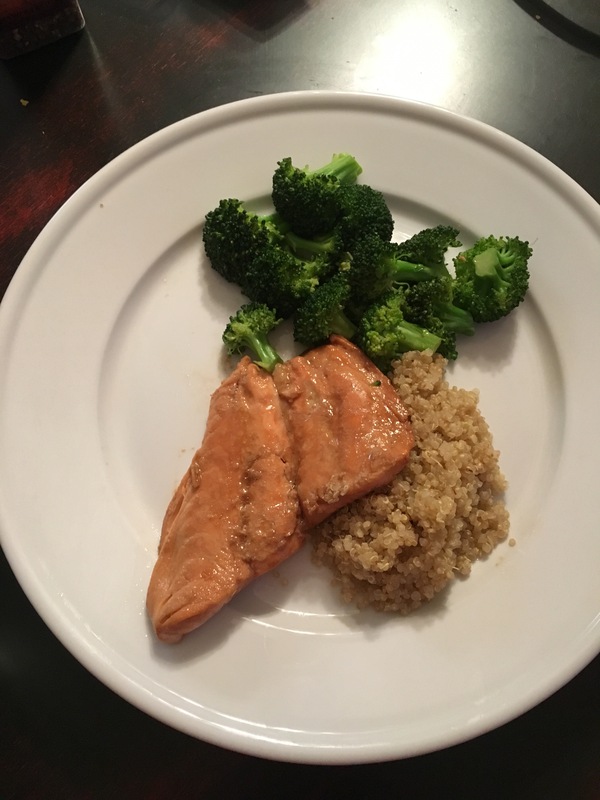 Depending on the thickness of the salmon, the time will vary. I like cooking the first side around 4 min until it’s looking nice and brown. You could also grill it or some times I use my panini maker to cook it. Turn the salmon and cook the other side to your liking, just make sure you don’t get it too done. It gets dry and isn’t as good. I cooked mine for another 4 minutes and then I had one piece that was a bit more thick so I had to leave that one on for a minute longer. Also, tomorrow is my Friend Friday guest post that you won’t want to miss!! AND how many of you have tried Christina’s Overnight Oats recipe? It’s turned out to be my morning favorite. 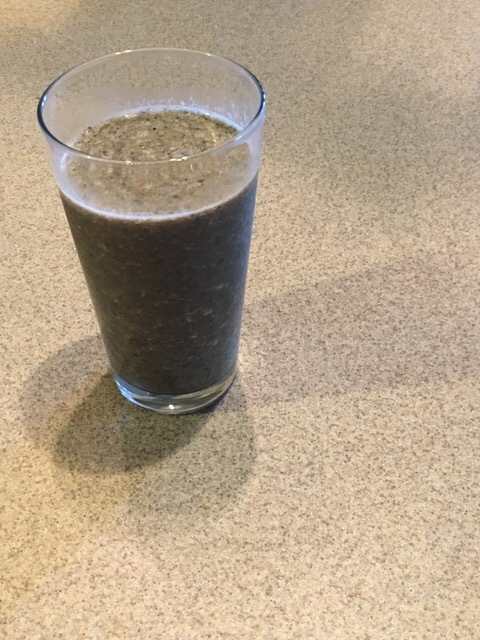 I now have it every morning for breakfast– it’s like having a breakfast treat!! My new fav! If any of you have a favorite recipe to share, I would love to have you as a guest for my Friend Friday post. Please email me at itsapegslife@gmail.com. I would love it!! 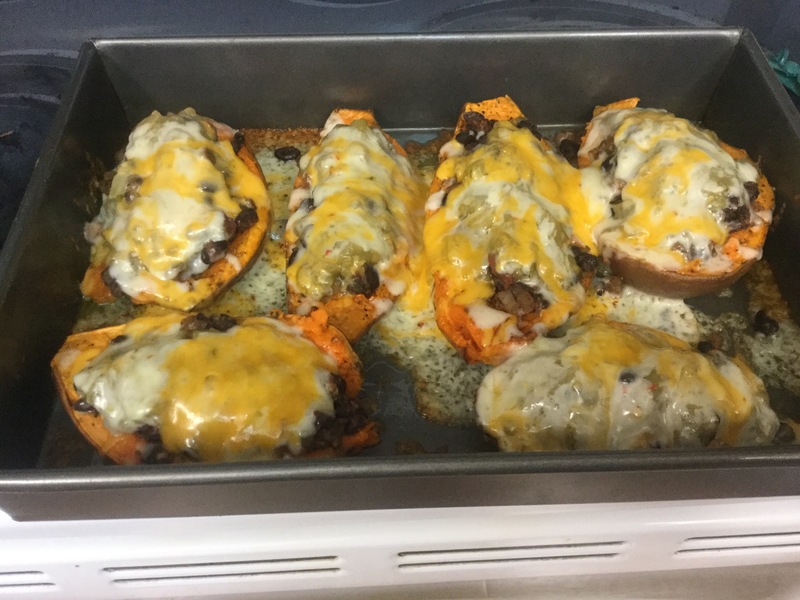 Earlier this week I posted a recipe for the Mexican Sweet Potato Boats and I had leftovers. Rather than just warm them up, I decided to make them into one of my favs. Can you tell I love Mexican food and I love sweet potatoes? Haha. 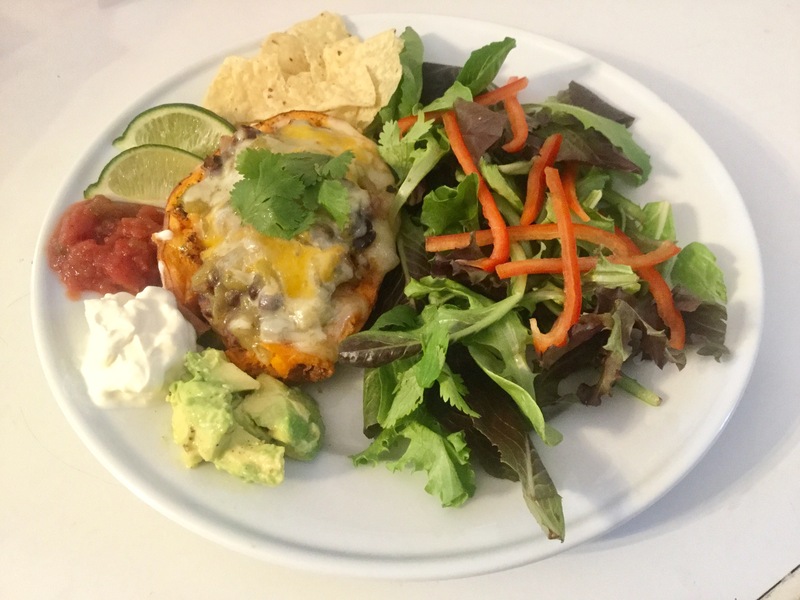 So here is the baked Mexican Sweet Potatoes cooked just for a refresher. :). Preheat oven to 400 degrees. To make the enchiladas with this recipe, I just took a spoon and scooped out the goods from the peeling of the sweet potato and placed it in the tortilla. Now put some green chile sauce on top and a little more cheese, roll the tortilla and place a baking pan. 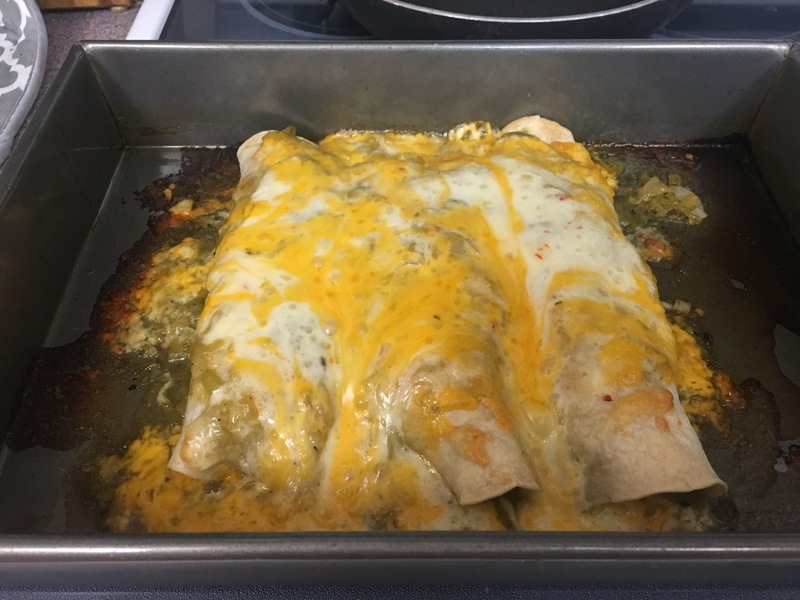 Put the rest of the can of green chile sauce on top of the enchiladas and more pepper jack cheese and cheddar cheese. Place in oven for 20-30 min. Enjoy! 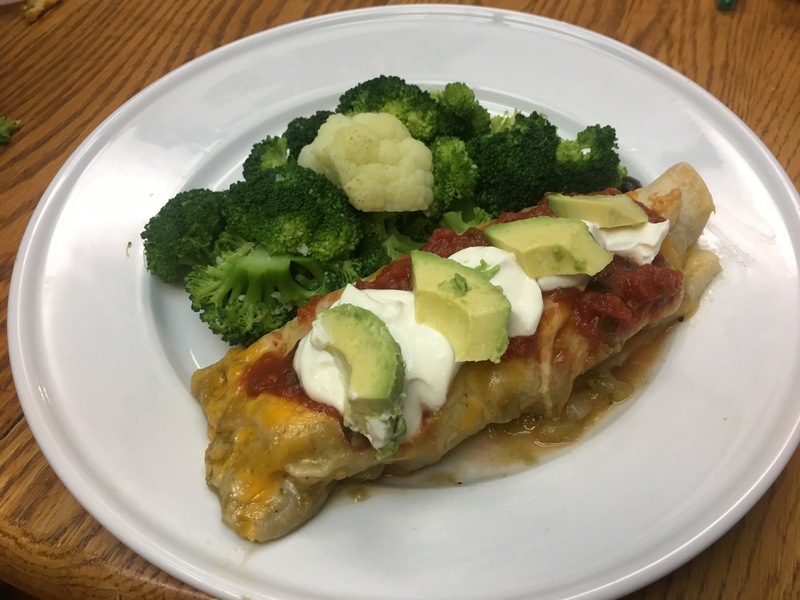 I’m excited to post this Meatless Monday recipe! I got the idea from a picture I saw and ran with it! 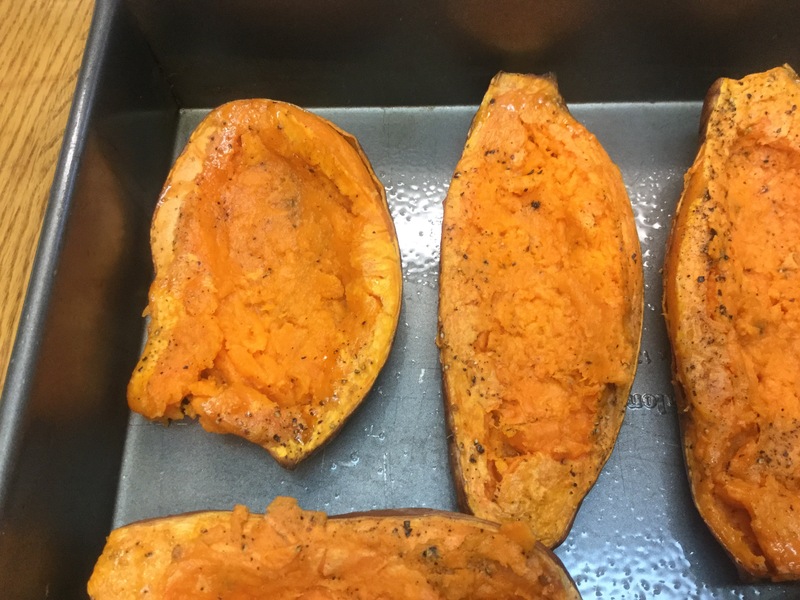 Half sweet potatoes, brush with olive oil, sprinkle with salt and pepper, and bake in a preheated oven on 425 for 40-45 min. You can tell if they are done when you poke it with a fork. It should go in easily and that’s a done sweet potato :). I poked all of mine because they were all different thicknesses. With the back of a spoon slightly smash the middle of the sweet potato to form a half circle so you can fill it with delicious goods :). 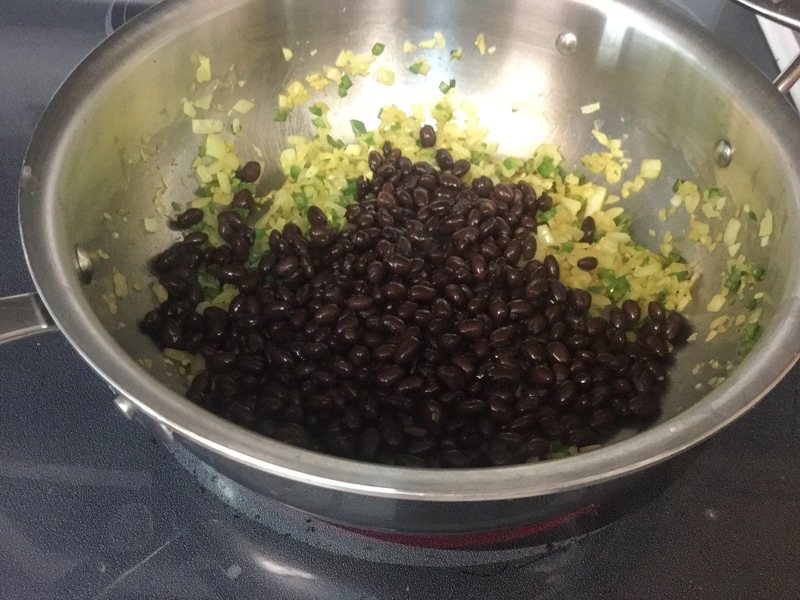 Sauté jalapeño and onion in olive oil until onion is translucent and add drained and rinsed black beans. Heat for a few min and set aside. 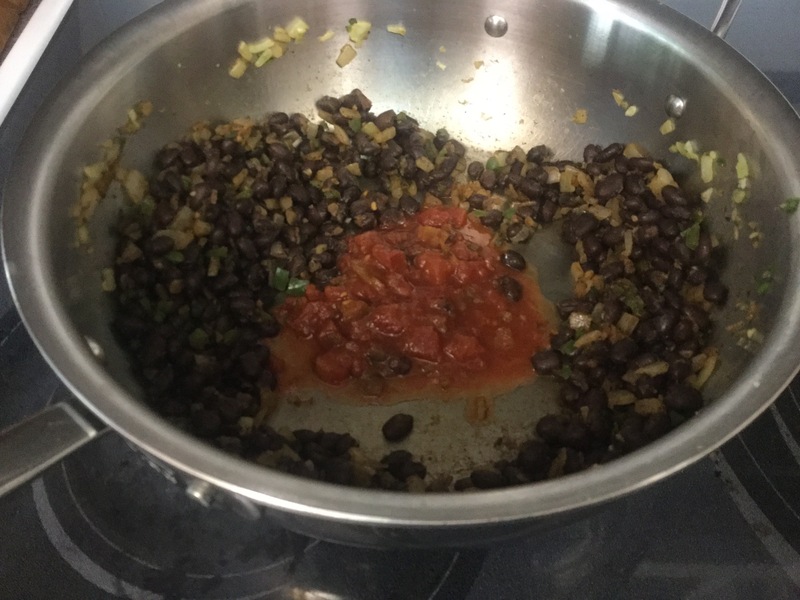 At this point, you can add 1 c of your favorite salsa. 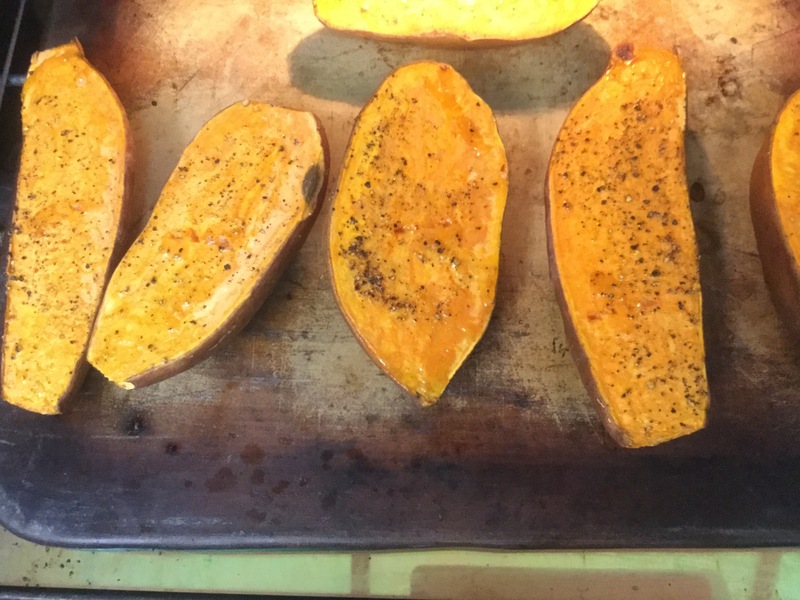 Place groved sweet potatoes in a 9×13 pan or larger if needed. Now it’s time to fill those babies! 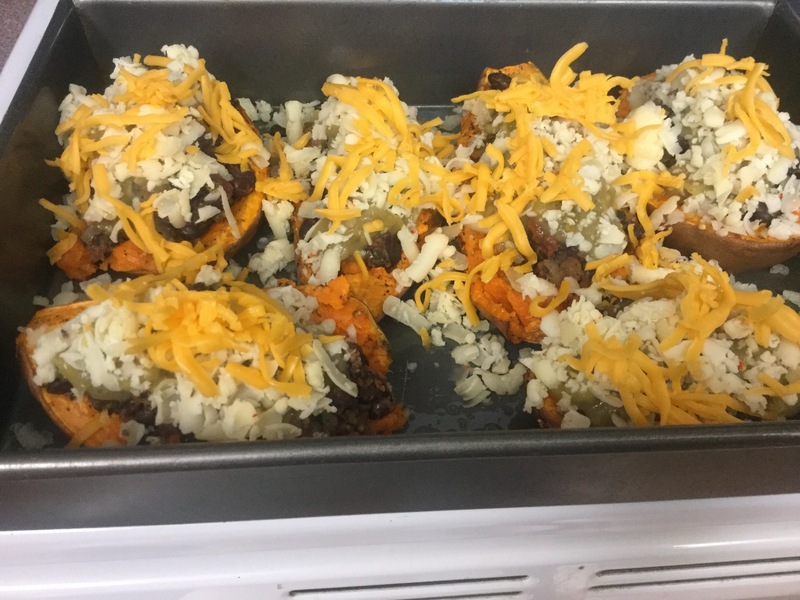 First, fill with the bean mixture, put a couple of spoonfuls of green chile sauce on top and then sprinkle pepper jack cheese and cheese cheese to top it off. Mmmmmm my belly is growling! Bake for 20 min or until cheese has completely melted. This is one of my new favorites and if you have any leftovers, I’ll show you how to make them into a Luscious Leftover later on in the week :). My hubs loved this one too :). Bonus! I’m so excited to post this guest post!! Heidi has been one of my dear friends for many years. 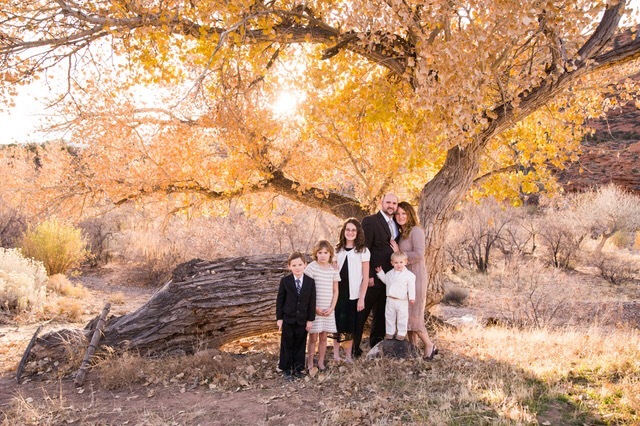 She is a wife and an incredible mother to FIVE very handsome boys. She is a master cook, an incredible runner (one really fit chick 🙂 and just one of the sweetest friends you’ll ever meet. Also, no matter what happens to her in life, she always has a smile on her face :). Also, Heidi has some amazing gluten free recipes and they are sooooo good. Thanks so much for this post Heidi! You’re a sweetie! Here’s the scoop from dear Heidi :). This is one of my favorite treats! I haven’t been a huge gluten free treat lover, but since I was diagnosed with celiac a little over a year ago I have tried a lot of gluten free treats and many of them are ok but not great. But not this one! It’s one even my family will eat and you can’t tell it’s gluten free. I got this recipe from a friend, Crystal Boren. 3. In a large bowl cream together oil, sugars, and eggs. 4. In a separate bowl whisk together flour, baking powder, baking soda, salt and cinnamon. 5. Gradually add the dry ingredients into the wet ingredients, alternating with buttermilk. 6. Mix until just fully combined. Be careful not to over mix. 7. Fold in shredded carrots. I like to shred my carrots in my vita mix because it’s easy. 8. Also fold in the applesauce, coconut flakes and vanilla extract. 9. Pour batter evenly into prepared pan’s. 10. Bake about 25 minutes until center is set. Do not over bake! Mine usually takes about 28 minutes but check it after 23 minutes. 11. Put cake directly into freezer to cool. 12. While cakes are cooling prepare the frosting. 1. First cream together the room temperature butter and room temperature cream cheese. I like to use Greek cream cheese because it has less fat and more protein. 2. Add in the confectioners sugar and vanilla extract. 3. Mix until silky and creamy. Add more sugar if the thicker texture is needed. 4. When cakes are cool remove them from the pans and frost, sprinkling the tops with walnuts. Yes the finished cake is on a different platter because it fell off of my cake stand, so frost with care–haha. And WaLa! It’s delicious! What do you do with all of that leftover roast beef? You make it into a different meal that is delusciousness :). I just totally made up that word haha, but it is is fitting :). I chose to make some BBQ beef sandwiches. You could also put the beef on top of some rice and that would be amazing too! Either way, BBQ beef is a hit at our house :). The homemade BBQ sauce is one I adapted from “A Taste of Home” recipe and it’s the best one that I’ve found. Roast Beef, shredded (if it has been in the refrigerator, I like to warm it in the microwave for just a bit and then put it in the BBQ sauce). Stir together ketchup, brown sugar, vinegar, salt mustard, Worcestershire sauce, garlic, bay leaf, garlic powder, paprika and hot pepper sauce. Bring to a boing. Reduce heat, cover and simmer for 30 min or until heated through. Discard bay leaf. Add shredded beef and serve on hoagie buns or rice :). AND don’t forget those veggies :). Who doesn’t like a good roast beef dinner?!! I remember after having my 5th child nearly 20 years ago, a good friend brought me a roast beef dinner and, my oh my, did that hit the spot!! It was just what my body needed after going through child birth. Beef has some great protein and iron in for the bod and sometimes that’s exactly what we need :). This recipe is from my dear sister-in-law, Tami, who is one of the best cooks I know and it is SO SIMPLE!! You will love how tender the meat is, especially, if you buy the right cut. I like to buy chuck roast and make two roasts, so I can use the leftovers during the week for another delicious meal, which I will blog about later this week. Also, on Friday, I have an exciting Friend Friday post that is going to be so delish for us to make and it is gluten free too! You would not even know it though, so stay tuned :). IMPORTANT: Get the right cut of roast. All roasts are not created equal. I had a friend try this recipe and it didn’t turn out great because of the cut of the roast. Get the chuck tender cut or chuck roast for best results. Place unthawed roast on a clean platter or sometimes I use a cookie sheet to catch all of the salt and pepper that some times makes a mess. Also, notice the marbling in the roast. That means this is going to be a very tender one. GENEROUSLY, sprinkle garlic salt, onion salt, pepper and minced garlic on both sides of the roast. Wrap roast in saran wrap and let set over night in the refrigerator. THE NEXT MORNING…….. ALLOW 8-10 HOURS COOKING TIME ON LOW. Place roast, quartered white potatoes, and carrots in slow cooker and salt and pepper the veggies. DO NOT ADD WATER!! I know, I know, you want to, but TRUST ME, PLEASE DON’T!! As the roast cooks on LOW, it will cook in it’s own juice :). Remove the veggies and the roast and place on platter. I like separating them and putting the veggies in a bowl and the roast on a platter. I made the gravy with the drippings from the roast. First I strain drippings and then put them in a pan or back in the slow cooker if your cooker has a sauté option. This one does and I love it! Boil the drippings and make a gravy thickener with 1 c. water mixed with 1/4 c. flour in a shaker and shake it up well. Slowly, pour flour mixture in boiling drippings and in a couple of min the gravy should thicken. Taste to make sure gravy is seasoned to your liking. The meal spread :). I served a green salad and fruit to complement the roast beef dinner. Such a great comfort meal! Nothing is better than gathering family and friends around for a delicious great meal. ENJOY :).